... is an artist, a musician and the editor of Sacred Hoop Magazine - a leading international magazine about shamanism, which has been published since 1993. 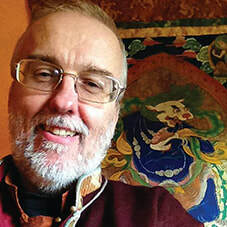 As a painter he is drawn to the sacred art of Tibet, as well as Persian, Indian and medieval European art. He has had a life-long interest in shamanism and the sacred objects used in shamanism and Tibetan Buddhism. Over the years he has worked with many gifted medicine people and shamans, but is now deeply apprenticed to his own spirit helpers, whose teachings never fail to awe and surprise him. As a musician he has a great interest and love of the early medieval music of the trobadors, and has a collection of nearly 60 medieval and world music plucked stringed instruments, and about the same number of Central Asian rugs - both of which breed well in the damp Pembrokeshire air where he lives.